The National Institute of Technology Raipur (NITR) all those students who has passed Degree Examination / Post Graduate Examination during Academic Session 2012-13 and all those scholars who has declared eligible for the award of Ph.D degrees to take part in the Fourth Convocation Ceremony with their parents / guardians. The Convocation Ceremony will be held on Wednesday, January 8, 2014 at 11.00 am. 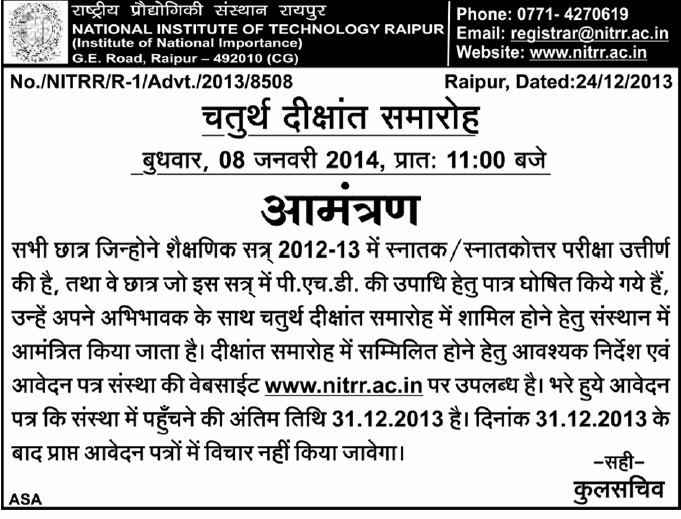 Filled in application form shall reach to the institute's office on or before 31.12.2013. Applications received after last date shall not be considered at all.